Domestic and national disintegration: Neil Dowden reviews the The Kenneth Branagh Theatre Company’s production of The Entertainer. The Entertainer at the Garrick Theatre. Photo: Johan Persson. The Kenneth Branagh Theatre Company close their admirable year-long residency in the West End with John Osborne’s 1957 state-of the-nation play The Entertainer. In it a parallel is drawn between the decline of the music hall and the waning of the British Empire, as the ‘nudies’ supplant the traditional entertainers in a seaside theatre and Britain undergoes humiliation in the 1956 Suez Crisis showing it is no longer a big player on the world stage. Excerpts of second-rate variety artist Archie Rice performing in front of an unresponsive audience in a half-empty auditorium are intercut with scenes of family strife at home as they await news of the older son’s involvement in the war in Egypt. Pacifist younger son Frank has just been released from six months in jail, and socialist daughter Jean has broken with her fiancé after attending an anti-war demonstration in Trafalgar Square. While Archie’s retired music-hall star father Billy grumbles about things not being what they used to be as foreigners are taking over, his second wife Phoebe worries about the future. Meanwhile, the unfaithful, fraudulent and heavily indebted Archie is dancing on borrowed time. Written straight after his trail-blazing Look Back in Anger, The Entertainer also features a disaffected younger generation thrusting for change in class-bound post-war Britain, but here the focus is on a man in mid-life crisis and Osborne’s tone is more elegiac. Though characteristically verbose and getting bogged down in somewhat static, gin-induced mutual recriminations, the play resonates a strong feeling of domestic and national disintegration. Director Rob Ashford has merged the theatre setting with the Rices’ digs to emphasise the performative elements, though this acts against the public mask/private face dichotomy. 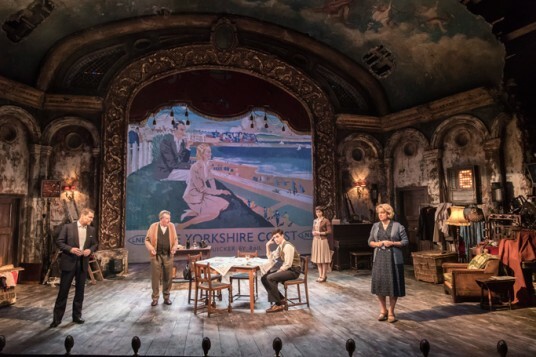 Christopher Oram’s striking design of tawdry gilt proscenium arch and peeling frescoes, with props strewn on the sides of the stage, and a seaside railway poster backdrop, sets the fading theatrical scene nicely. But the four alluring female dancers’ choreography by Chris Bailey is more nightclub cabaret than tacky revue. Famously the part of Archie Rice was created by Laurence Olivier, the first of his generation of actors to embrace the new wave of drama pioneered at the Royal Court, where he wowed audiences with his song and dance routines and charismatic pathos, immortalised on film. So often compared to Olivier in his career, Branagh strongly conveys a performer who is putting on an act even offstage as he denies reality and shirks responsibility, but he lacks Olivier’s seedy glamour. Branagh’s camp stand-up patter is suitably saucy and he convinces as a man near the end of his tether (‘I’m dead behind these eyes’), but his jaunty tap dancing is almost too slick, while he seems a bit too wholesome for such a morally ambivalent role. There’s a strong cast supporting cast. Gawn Grainger (a late replacement for the indisposed John Hurt) excels as the nostalgic but racist Billy who waxes lyrical about the Edwardian good old days, while fuming at the ‘Bloody Poles and Irish’, and Greta Scacchi also impresses as the long-suffering Phoebe who wants some security in her life. Sophie McShera is a little insipid as the idealistic Jean, but Jonah Hauer-King’s Frank is an angry young man with sensitivity who realises his father is on his last legs.